I do not have time to do much (if any) teacher prep. Teacher cannot need to know the language already. It has to really teach my kids to speak that language. They have to enjoy it enough that I don't have to fight to get them to do it. Did I mention that I don't have time to learn a language ahead of them? Middlebury Interactive Languages actually does a great job of meeting all of these requirements. 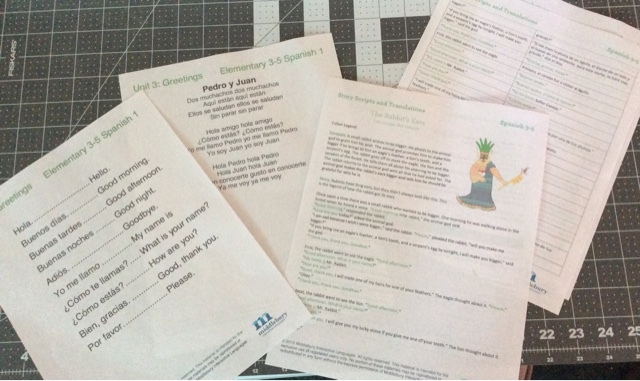 We chose to focus on their Spanish Courses, and Trina has really been enjoying Elementary Spanish 1 (Grades 3-5). Below is a photo of all the printouts I did for their current unit, (Greetings, Unit 3). It isn't necessary to print it out, and you certainly can print in grey scale. But learning Spanish is important, and I decided the color made it a bit more fun. This is taken before Trina puts the pages in her fancy notebook. As you can see, the vocabulary list is pretty short, which makes it easy to actually learn it all over the two weeks you spend in the unit (six lessons per unit, intended to be done three days per week). 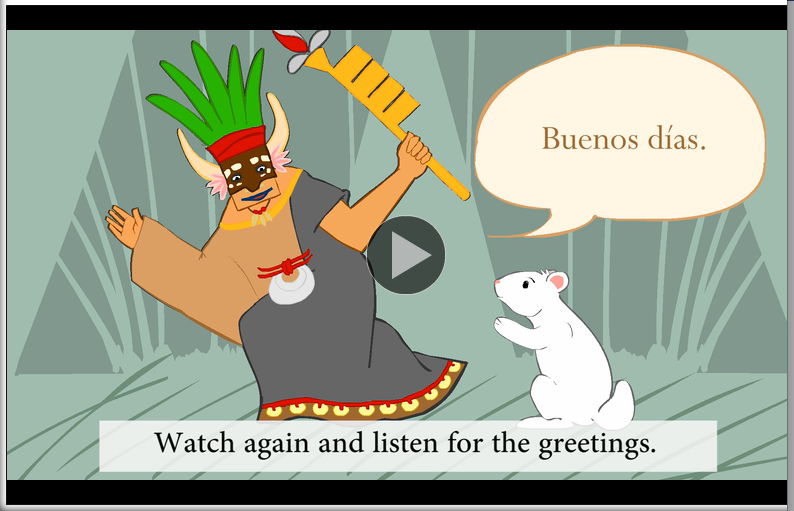 The story is an authentic tale from one of the dozens of Spanish-speaking countries. During the course of the unit, you listen/watch the story a few times. Through the images and the words you have learned, you are able to grasp the main plot, but the printout summarizes that as well. It also walks through what is being said in the story, with the words the students should know being in green. In this unit, it is a tale of how the rabbit got his long ears, and it involves the rabbit going around to multiple creatures to try to collect various items. That involves a lot of greetings in the conversation. So the rabbit has many opportunities to say things like hello, good morning, how are you, please, thank you and good-bye. There are a lot of other words in the story too, with translations on the printout, so Trina can easily go in and add some additional vocabulary learning when she wants to. My daughter enjoys Spanish and doesn't argue when I tell her to do it. That's really a huge deal to me. And she's using it in normal daily life, which tells me she truly is learning it. Having some experience with the upper levels of Middlebury's language programs, my big fear was sending kids into the Middle School or High School levels and having them feel completely overwhelmed. I think a year of the elementary Spanish is going to put her in good shape to take on Middle School Spanish 1. 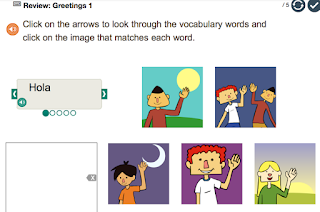 The Greetings lesson in Middle School, intended to be covered over two weeks, includes all of the vocabulary above, plus another 23 words/phrases, and she'll need to be able to type them out, including accents and all. Already being familiar with saying at least a third of the vocabulary will put her in good shape to take on the rigors of middle school Spanish. I am pleased with this course. 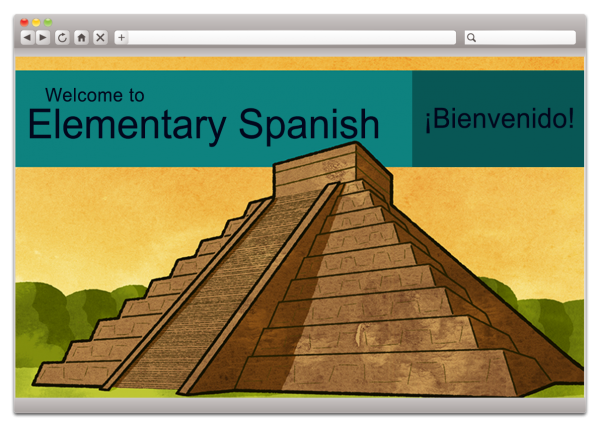 Go see what others had to say about Spanish, and also about German, French and Chinese. Crew Members used various levels with kids from K-12!